Above: MC Ben Fox with the multi-award winning “Queen Aero Naughtical”, modelled by Alexandra Sheedy, with her co-creators Sarah Hill and Simone Guascoine. Judges Brigida Stewart and Lucy Stewart at right (not seen, judge Zoya Godoroja-Prieckaerts). 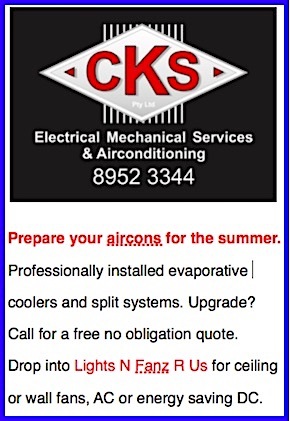 WORDS by KIERAN FINNANE. PHOTOS by ERWIN CHLANDA. 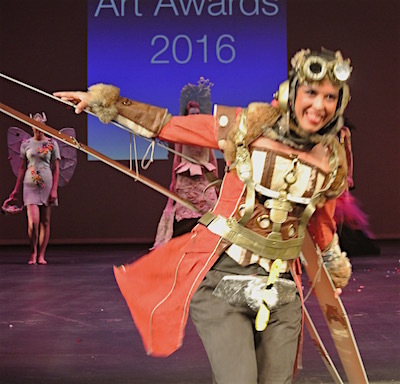 Judges and The People rarely agree, but at Saturday’s Wearable Art Awards the vote was unanimous: “Queen Aero Naughtical” got the tick. The homage to pioneer women pilots, created by Sarah Hill and Simone Guascoine, won the Central Craft Acquisiton Award, which means that it will enter their permanent collection, as well as People’s Choice and, of course, won in its category, Over the Top. 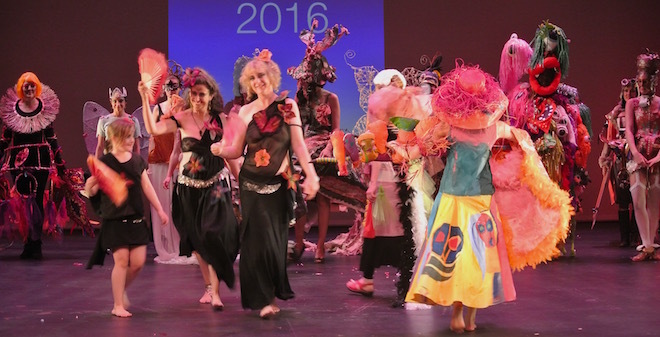 The category was for entries “from the waist up” but the Queen was a top to toe effort from these practised Wearable artists (also stalwarts of the Sustainable Couture event) and by the model, Alexandra Sheedy (at left) who gave a fittingly zestful performance . The judges commended the attention to detail, some of which was at too small a scale to be appreciated by the audience, although not the propeller which was used to good effect. 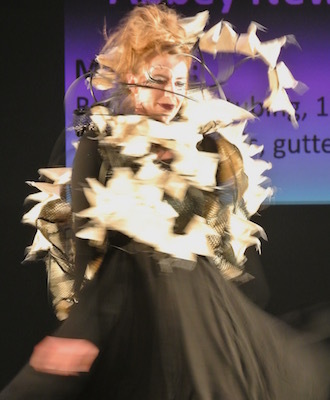 Highly commended in the Over the Top category was Philomena Hali’s “Synapse – Confusion” (below right), which united clarity of concept with clarity of expression, translating very successfully to the scale of the stage. It was a distinctly sculptural piece, as the judges noted, and had the further merit of being about an aspect of the body – brain function. It was great to see an entry featuring Aboriginal art, especially given the rise of interest in textile arts and fashion design in the region, as demonstrated at this year’s Desert Mob symposium. The entry was called “Julpu Kuja Nyinami Yurntumu-wana”, a collaboration by a group of four women, one of them the Warlpiri artist Karen Napaljarri Barnes, whose boldly painted figurative works feature birds as well as other animals. The collaborators were Amanda McMillan, Fiona Rogers and Cecilia Alfonso. In their wearable creation, Barnes’ birds were painted on a full skirt (see photo below) and others were in soft sculptural form, sitting along a branch. The artists’ statement was informative about the species depicted, with Warlpiri and common as well as scientific names, and a brief explanation of the significance of different species for Warlpiri people – some tell of rain coming, some can make children sick, others help with hunting, or bring messages of love. The judges gave this entry the Fantasia award. This was the 15th iteration of these awards. The house wasn’t sold out though it was comfortably full, following a matinee show. 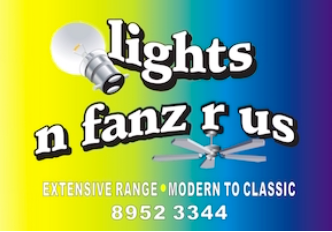 Enthusiasm has cooled a little, perhaps because they follow a recognised formula, with the shows becoming ‘variations on a theme’. 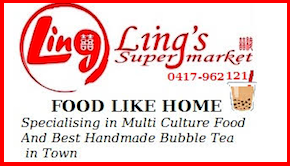 Judges say they look for a ‘wow factor’ and a good guide to that is audience reaction. There were cheer squads for certain entries this year but overall the people meter was just bobbing along nicely. As always there were some beautiful and admirably crafted entries, others that were charming and fun, but nothing too edgy, challenging, exciting or very moving. It might be time shake things up: revisit the categories and prizes, create new challenges. 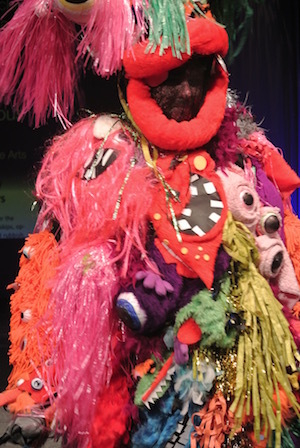 Below, at right: “Julpu”, modelled by Carlita Davis, created by Karen Napaljarri Barnes and collaborators; at left, “Return to Eden”, created by Ambrosia Jones, who also modelled her creation together with collaborators. 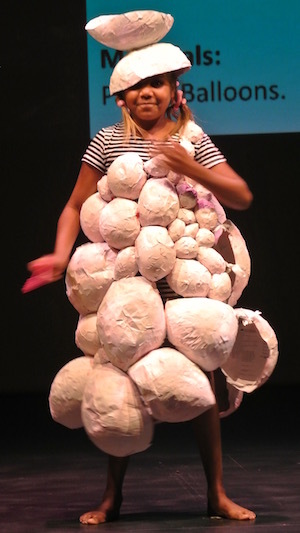 Nikea King modelling her Bubble Ballgown, co-created with Gina Forrester, and winner of the Youth Award. There were 15 entries from young people in this award and they were also eligible to win in other categories, which some of them did. 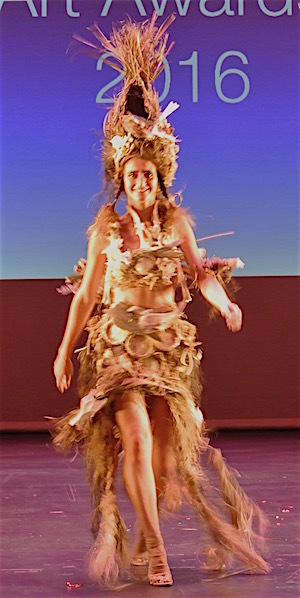 A vampish Tahlia Paton took out the Performance Award for “Tradie Queen” , designed by Maika McGuirk-Hanon. The train of the outfit was put together from hi-vis vests. Jacob Foster, Devlan Abbott and Ronald Pedrezuela won the Encouragement Award for their entry titled “Slavery”, quite a performance art piece, as noted by the judges. 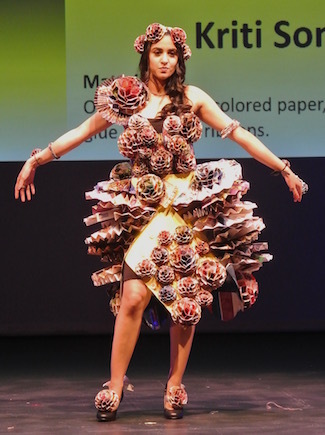 Kriti Soni, model and designer, put many hours of cutting and folding old magazines and coloured paper to create the beautifully crafted “Princess of Blossom”, earning her the First Time Entrant Award. 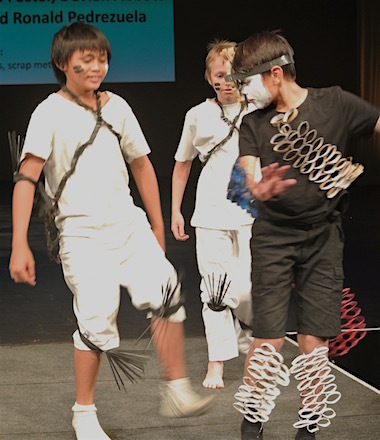 The Alkira Wearble Arts Group threw everything at “Monsterlicious”, modelled by Simon Cheers, to take out The Best Use of Recycled Materials Award. 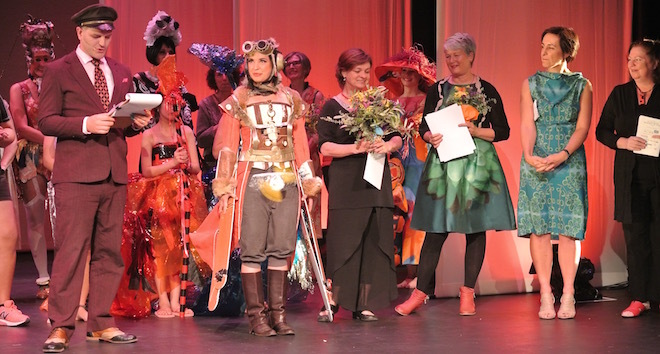 “The Bower of Love”, inspired by the bowerbird’s nest, took out the Nature’s Bounty Award, created by veteran designer Carmel Ryan, and modelled by daughter Emily Mackenzie. Sarah Mason (of the Circosis duo) worked wonders with a hoop in the post-interval entertainment, collaborating with the Youth Awards All-stars. I have to agree with Kieran’s closing statement. 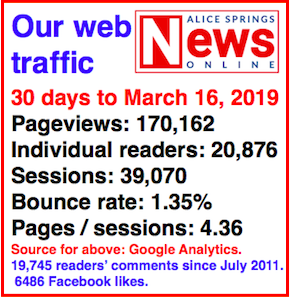 As much as I enjoyed the show (full disclosure – I am acquainted with some of the models and some of the artists), I, too, think the format and presentation would benefit from a shake-up.